India has been the most inform team in the world cup alongside host nation New Zealand winning all of their 6 group games and booked their place in the quarter finals where they will be facing 4th place team from Group A which happens to be fellow sub continent team Bangladesh. On paper this should be a walk in the park for inform Indian team but Bangladesh has had Indias numbers on several occasions in the past as far as big competitions are concerned. Tigers beat India in 2007 world cup which resulted in India getting eliminated from the competition and Bangladesh team and fans will be hoping the same. Indian won all six of their group games and not many people could have predicted such indian dominance after their abismal showing in the tri series prior to the world cup where they failed to win a single game against Australia and England. India beat arch rivals Pakistan in their opening game and never looked back beating the likes of West Indies and South Africa along the way and making easy work of Zimbabwe, UAE and Ireland. Indian Bowling has been great, all the front line bowlers have performed with such precision and line & length but still this is probably the one area which Bangladesh can hope to exploit if they were to get a result in this game. Indian batting has been great with top order and middle order all scoring runs at some point of the group stages MS Dhoni will fancy his teams chances even if India have a bad bowling day because they have a batting to back it up. 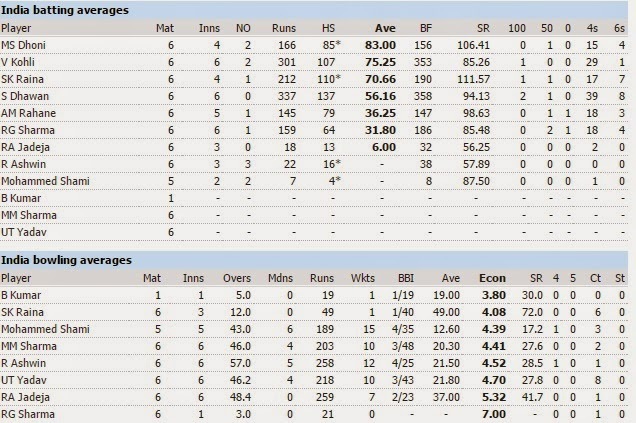 here are India squad statistics with both batting and bowling during group stages. Bangladesh on the other hand defeated Scotland, Afghanistan and England plus a no result against Australia ensure their passage to the quarter finals. Their batting has been decent so far with Mahmudullah getting back to back hundreds as bangladesh go in the quarter finals. They have a huge task of fiddling with inform indian bowling lineup which has exceeded all expectations so far. 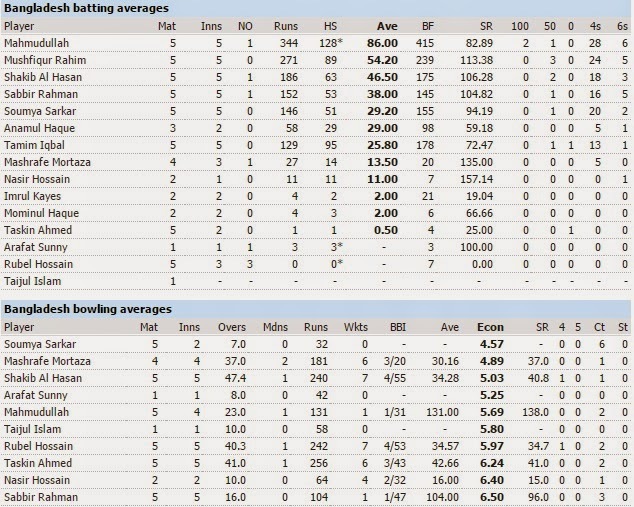 Here are Bangladesh teams statistics with both bat and bowl so far in the world cup. As far as the match result is concerned I can not see Bangladesh getting the better of India because of the fact that Indians are in great touch with both bowl and bat. Why ? because even if we assume that India might have a bad day with their bowling they can always back their batting ability to chase big totals above 300+ and unlike recent times even if Indian batting dont click they can always rely on their in form bowling unit which has been sensations where India’s front line bowling unit of (Mohit Sharma, Mohammad Shami, Yadav and Aswin) has taken 47 wickets and all of them has conceded less than 5 rpo so far (average 4.45 rpo). Bangladesh on the other hand has batted well but their bowling has been exposed where all of their front line bowlers has gone for higher 5 rpo. So considering both teams lineups we can safely predict that India should get through this game with rather ease, well atleast on paper, but we all know that games are not played on paper and Bangladesh might pull out a surprising result. Mind you they will have to play out of their skin to get the better of India.